gReader Pro (Google Reader) – Better Than the Official Reader App? Google updated their reader app by giving it a makeover in the design department not too long ago. So what do we think of the new design—fresh or old-hat? I had a look at an interesting alternative: gReader Pro (Google Reader). This app comes with a lot of settings options and will allow users to read even when there’s no internet connection. Our verdict? Find out everything about our App of the Week in today’s review. Setting up gReader Pro (Google Reader) is a piece of cake and you don’t even need to enter your Google password. Simply tap on the account name and register and Bob’s your uncle. You will then see an overview of feeds and new articles. The feed favicon is also displayed. I must say that I became partial to gReader Pro (Google Reader) after a mere few minutes thanks to the speedy loading process for articles. Let’s cover the basics first: reading. Tap on a feed or ‘All Articles’ in order to see a list of unread articles. They’re shown chronologically and there’s a little preview image for each one (which can be deactivated if you so wish). There’s a tool bar located at the bottom of the display via which you can update everything or else mark all articles as read. Articles are displayed when you tap on them. The title and name of the feed as well as the date of publication are located near the top. Pinch-to-zoom is – regrettably – not available; there are two small buttons that allow you to enlarge and reduce, but luckily texts are generally adapted to fit the screen very well. You can star an article, mark it as unread, share it with others or forward it to the browser, all this from within the article itself. Skip from one article to the next by swiping across the screen (left to right or right to left). I really can’t go into all of them in detail – there are that many of them – but here’s an overview of the most important and useful ones. Firstly, you can change settings related to synchronizing, i.e. change the interval, the number of articles and whether syncing from Google Reader to phone as well as vice versa should occur. The perhaps most important setting is ‘Read offline’, which saves articles and hence lets you read feeds even you’re not connected to the internet. Go to ‘Cache’ in order to determine where you want to save to article to (storage or SD card). You can also select how many articles should be saved, whether images, sound, videos should be displayed. In order to prevent stuff from being downloaded via the mobile connection you can select WLAN. Stay in the loop by activating messaging. Go to the reading settings to determine how feeds are to be sorted, what gets done via swipes and whether you want plugins (Flash) to be activated. Should you want to share an article you can decide which part of the article you want to share, that is to say only the link, the title of the article and link, the link and a synopsis or all of the above. You can change the theme to a dark one as well as change the size of the font (in the app and the feed), and there’s a cool option that divides the display into two parts in horizontal mode—that’s a massive advantage to the Google reader app. Go to ‘Services’ and enter your Read It Later or Instapaper data in order to save articles and read them later on. Very useful indeed, especially because you can make use of the Google and Instapaper Mobilizers. What’s that, you ask? They’re two services that adapt websites to fit small displays so that you get a good overview despite the small screen. gReader Pro (Google Reader) is an advanced Google reader app that makes reading news that much easier and comes with a ton of useful functions. This app makes perfect sense for people who tend to check Google Reader daily (or even more frequently than that). I would go so far as to say that it is downright impossible to stuff more useful functions (all the while keeping it clean and tidy) into an app. The controls are super simple. A swipe here and a swipe there—everything works very smoothly. What’s more, the controls are intuitive despite the sheer mass of settings options (which, by the way, are organised very neatly). 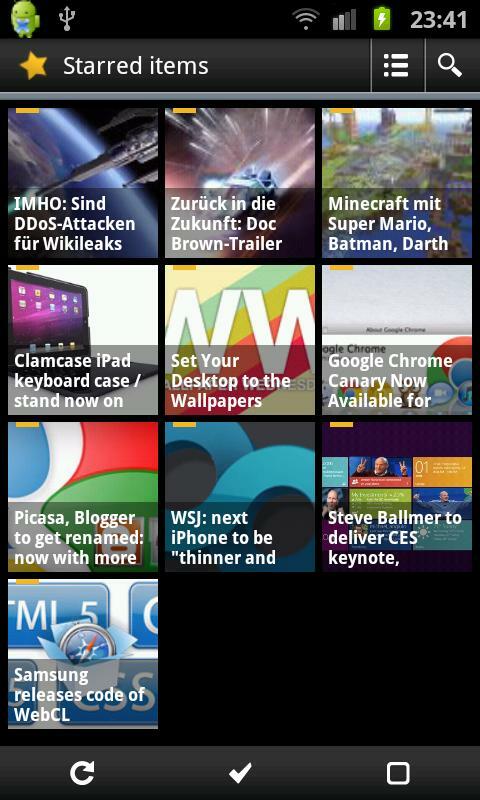 gReader Pro (Google Reader) is an RSS app but the design isn’t bad at all. 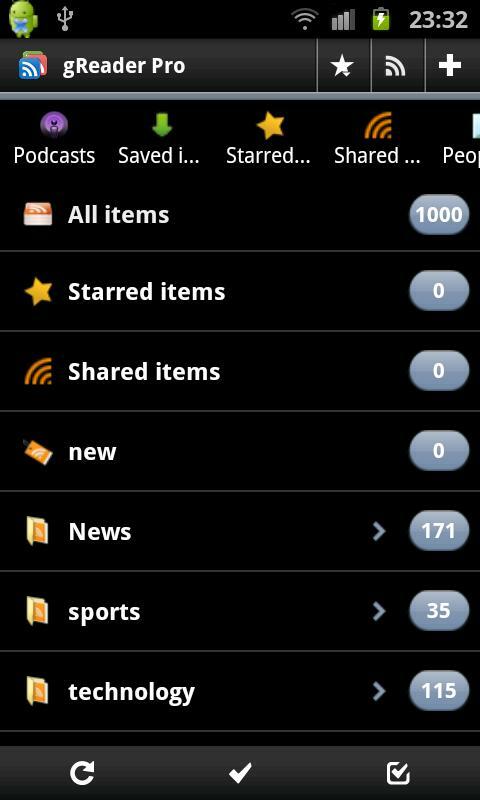 A big advantage gReader Pro (Google Reader) has over the normal reader is the app’s speed. I found that articles loaded much faster, and all the while gReader Pro ran very smoothly. gReader Pro (Google Reader) usually costs 3,99 € // 5,35 US$, but seeing as it is our App of the Week you can download it for only 1,99 € // 2,67 US$.